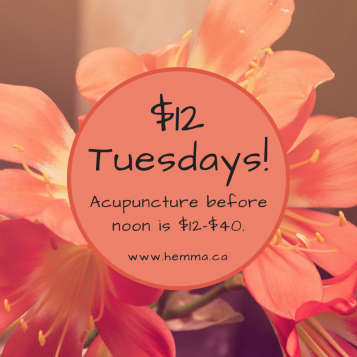 Acupuncture $12 Tuesdays are back!!! For the month of June, when you come in before 12pm on Tuesdays, you can get an acupuncture treatment for $12! Every Tuesday in June between 9am-12pm our sliding scale will be $12-40 as opposed to our regular $20-40. We will also be waiving the $10 New Patient Fee during this time. If you have been curious about acupuncture, this is a great chance to check it out! Bring a friend! Same great service – super savings! Book your appointment now.